The $20 Saint-Gaudens double eagle is one of the most beloved of all United States coins. First minted in 1907, these beautiful gold coins were made by the United States Mint for more than a quarter century, until President Franklin Delano Roosevelt abolished the Gold Standard during the Great Depression in 1933. Millions of U.S. gold coins were made up through 1933, yet relatively few survived the gold recall stemming from President Roosevelt's issuance of Executive Order 6102 on April 5, 1933. The law, which required Americans to relinquish their gold at the rate of $20.67 per ounce, remained in place until December 31, 1974. By then, countless gold coins had long disappeared into smelters' pots. Today, coin collectors cherish the precious gold coins that remain. Of those, the Saint-Gaudens $20 coin is widely regarded as the world's most beautiful gold coin. It was designed by renowned artist and sculptor Augustus Saint-Gaudens, who crafted a timeless design on the coin featuring Miss Liberty. She is seen on the obverse bearing her torch as she strides over craggy rocks while the sun rises behind her over the United States Capitol. A majestic American eagle soars across the reverse field. The Saint-Gaudens $20 has long been hailed by artists and hobbyists as a numismatic masterpiece. Yet, when it premiered in 1907, the coin lacked an iconic American phrase: the motto IN GOD WE TRUST. The beautiful Saint-Gaudens $20 double eagle was born during the so-called Renaissance of American Coinage. This renaissance was sparked in the early 1900s when Roosevelt, who took a keen interest in coins, thought our national coinage was unattractive. He commissioned Saint-Gaudens to redesign our nation's coins, and in 1905 the artist began working on his first designs, which included his classic $20 motif and the $10 Indian Head eagle. Roosevelt afforded Saint-Gaudens creative freedom with his coin designs, but the president specifically requested the artist to omit the motto "IN GOD WE TRUST." Roosevelt, a devout Christian of the Dutch Reformed Church, believed referencing God on coins was a debasement of His name and was furthermore sacrilegious if the coins were used for illicit purposes. Meanwhile, Saint-Gaudens preferred omitting IN GOD WE TRUST because he believed the words would clutter the design and detract from the coins' artistic elements. The $20 Saint-Gaudens & $10 Indian Head coins were released in 1907, sadly the same year their celebrated designer died of colon cancer. While the designs of the new gold coins were widely praised by numismatists, art critics, and the general public, the omission of IN GOD WE TRUST prompted a flurry of disapproving letters from concerned citizens. Congress responded to the controversy on May 18, 1908 by mandating United States coins on which the motto had previously appeared must carry IN GOD WE TRUST. All gold coins struck since July 1, 1908, have subsequently included the motto. Until Congress stepped in with the May 1908 legislation, $20 Saint-Gaudens double eagles were struck without the motto IN GOD WE TRUST. A total of 4,935,301 Saint-Gaudens double eagles were struck in 1908 without the motto, whereas only 527,758 pieces made that same year incorporated IN GOD WE TRUST. Why were far fewer 1908 With Motto $20 Saints made than No Motto pieces? Some numismatic scholars believe it was simply a matter of minting logistics, as coin denominations aren't necessarily struck on a consistent basis throughout the course of a year. For example, more 1908 $10 Indian gold coins were made with the motto than without. 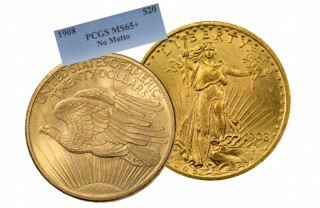 1908 With Motto $20 Saint-Gaudens double eagles became the first examples of the coin many call the world's most beautiful to carry a most beautiful motto, IN GOD WE TRUST. Barely more than a half million were minted and far fewer survive today due to brutal mass bullion meltings after the nation abandoned the Gold Standard. Surely, the 1908 With Motto $20 Saint-Gaudens double eagle is a scarce, historic numismatic treasure that belongs in the hands of anyone who enjoys classic numismatic art and appreciates American history.